Perhaps this person is honestly new to the hobby and does not know any better? Don't you think the Thomas book is a weak tool in regards to valuing whiskies in today’s market? Those prices were quoted when the whiskey market was at its zenith. Both demand and value of average example bottles has fallen for most of the whiskeys since the publication of the book. The book however is a great resource for company histories, distribution (to a certain extent), and rarity. Imagine trying to sell your house and trying to validate your asking price by using sales comparables that are 15 years old…………….. Here's one for you .An tractor salesman that I purchased some John Deere tractors from had a wife who collected bottles. I had been to their house and saw her collection . It had some average bitters a few common whiskeys some medies and some sodas one being a cobalt H&G .. I wasn't interested in any thing she had but I did tell her that the H&G was a very rare bottle .This was about 27 years ago.. The wife passed away and some time later John stopped by my office with the H&G soda in hand . He said you said this is a rare bottle so I'm giving it to you I told him John this is also a very valuable bottle and is worth a bunch . He said he didn't collect bottles so it wasn't worth much to him and do you want it or not .I took it and said thanks. Then Bev laid claim to it but she lets me keep it on my shelf. As always honesty is the best policy. You were honest with the tractor salesman and your straight up evaluation of the collection wasn't lost on the salesman. Here is another. One weekend, my daughter and I and the dog went to spend the day at the Yuba River above Nevada City. On the way down we passed by a yard sale. We didn't stop. We continued on down to the river, spent most of the day there. On the way out, we passed by the yard sale again. This time we spotted some early beach curser style bikes, that my daughter and I enjoy riding. So we stopped. The bikes were in so, so condition. So then, as I always do, I asked the elderly man (in his 80's) if he had any old bottles. He said, Yes, over in my shop I have a few. As we walk in, he pointed to some bottles on the window ceil. (only 6 bottles) 3 black glass ales, 2 sodas and a small green lady's leg looking bottle. The only bottle that really stood out, was the dark green Summit mineral water. The other soda was an aqua slick. Then I picked up the lady's leg, and read the bottom. It said Salutaris Bitters, S.F. It did not ring a bell to me, but it did have S.F. on it. So, I ask the man if he would sell the two bottles. He replied, yes,did you want them all. No, I said , just these two and what did you want for them. He said, make me an offer. Well, I knew that the soda was really good but I was not quit sure on the Bitters. So, I pulled out my wallet and gave him every dollar I had on me. A total of $53 dollars. I told him this is all I have on me right now. He held is hand out with a huge smile and said wow, thank you. He told me, he had found them some 40 years ago, while working for the forestry and they have been sitting there since. He was very surprised I had given him that much. I told him, I would have given you more if I had it on me. No, worries that's good enough, he said. So, my daughter and I headed home. When we got home I called (nor-cal) Mike Lake, who lives close by. I told Mike, I got a green summit soda today at a yard sale and a lady's leg bitters. He was at my house with in 5 minutes. He had never seen a true green summit soda. Wow! what a find, mike said. Then I handed him the bitters, his reply was, HOLY SH%* ! NO FRIGIN WAY. Do you know how rare this bottle is. No, I said. It isn't one I'm familiar with. There is only three of these known in green. This is a home run bottle, Mike said. I was on cloud 9 after that. Once the word got out, that I had these two heavy hitters, the offers started pouring in. Henness called me about the soda, and said he really would like that green summit. So, he gave me a great trade and some $ for the soda. As for the bitters, I was going to hang on to it and I did for about a year. In that time, I was told that this Bitters was the last one Warren was looking for. He did wright the book about it. So, just before the Downieville show some years back. I called Warren and told him I was bringing the Salutaris Bitters to the show. When I got to the show, I was mobbed by buyers making offers on it, but I was only going to sell it to Warren if he was interested. Some of the offers were double of what I was going to sell the bottle to Warren for. I met with Warren and showed him the bottle. He really wanted it. So, I gave him a fair market price and asked if that was fair to him. He said yes, and the bottle change hands. 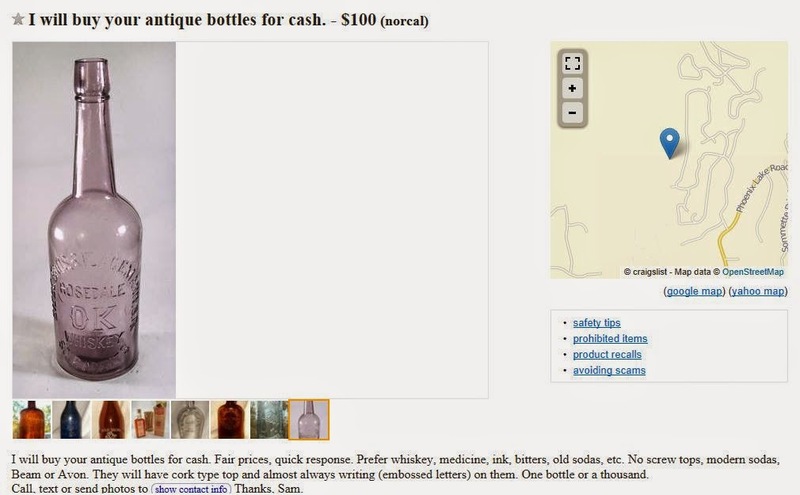 Now, if I had sold that bottle to the highest offer, Warren would have to pay more or double from that guy. Would that be fair? NO! but that's how this hobby works. 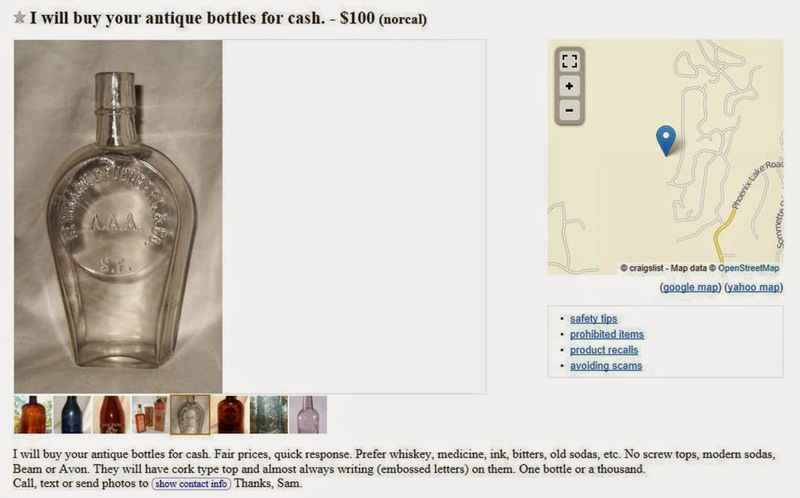 ......It wasn't so much the money for me, it was to see the bottle go to the right guy. After selling the two bottles. I wanted to do right by the guy who sold them to me. So, I went back to the old mans house, about a year later. There, I met the daughter and son of the man. They told me that their dad had passed way 3 months prior. I was too late. I told them that their dad had done something good for me and I wanted to do something good back. They said it wasn't important now, but thank you. I did anyways by mail. ...Call it what you want. Being in the right place at the right time, luck or good karma. That moment in time made four guys very happy. Note: I would have never stopped at that yard sale if it wasn't for the beach bikes. Good point, "Beware". Most of us with a few years of collecting experience under our belts are educated. Not so with the general public. There was a great deal more dialogue involved in this frog show than I included in the original post. I opted to omit the rest of the interaction for the sake of focus in this article. One comment above apparently defended unethical behavior due to the Thomas whiskey book (and perhaps Bob's as well) being too high in it's values? Western Whiskies have ebbed and flowed like the tide. Right now, they've warmed back up and prices are on an upswing. Regardless, since 2005, I've facilitated the sales of six glop top amber Rosedale's. I quoted both book value and stated that "My experience with this bottle is in line with Johns". An amber glop top Rosez, issue free, is (and has been) a solid meat'n'taters $2K glop top. Getting back to the original point. A $200~ offer on a $2000~ bottle (or bottles)?